I recently had some issues around Bubba interrupting me when I put the cub to bed, he takes ages to fall asleep and wants you in the room whilst he does. Bubba gets bored on her own or just wants to know what I’m doing so keeps bothering me and doing her best stage whisper…which then makes the boy sit up and cry and the whole process starts again. I was getting pretty desperate and hated it because that time was stressful, I’d often shout at Bubba to leave me alone (which I never want to do) and well it just wasn’t nice. So I hit Facebook with a plea and got some great ideas back; to use the ipad and have special games that Bubba could only plat at that time, this worked sometimes and not others as she wouldn’t always want to go on it (especially if she’d play on it earlier in the day), another suggestion was the quiet time box which when it got to it we didn’t have to use because the boy started going to bed later, we hit the summer holidays which meant daddy was home earlier and could take charge of one of the kids and I’d look after the other. I’m hoping to mix this up every week so it stays fresh and my main concern is that it’s quiet toys and games that she can do on her own preferably. To start with we are keeping it in our room so she can’t pillage it at other times (and plus there is nothing like the unobtainable box of goodies to peak her interest) . 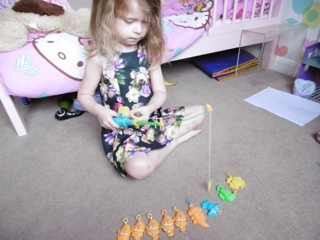 First up is some Poundland tat in the form of a fishing game that Bubba is quite taken with at the moment. I’ve added a wipe clean alphabet board because she loves a bit of writing now and practising her writing. 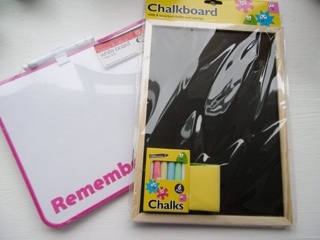 A chalk board and a white board so she can do drawing. We have stickers…everyone loves stickers and it’s the most quiet she ever is. A book just because she loves them (and I’m an Usborne at Home Organiser…more on that another day) so we have access to lots of wonderful and educational books. 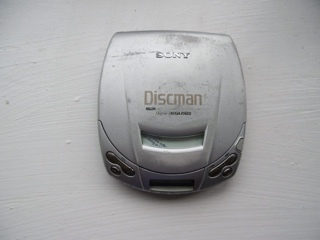 I’ve gone old school and added my old Discman as well because Bubba has recently got into listening to music with earphones in. It’s possibly the cutest thing to watch her bopping away, singing badly out of tune and then shouting at me because she can’t hear how loud her little voice is (perhaps that isn’t the best idea for quiet time) but if she takes it back to her room…you never know. I’m hoping this will work, I don’t want her to stay in her room forever and sometimes the extra early start is helpful to get me going on a work day but at 5.30am – 5.45am it’s all a bit painful for my brain.